They say Teamwork Makes the Dream Work. Unfortunately, teamwork can also cause nightmares. 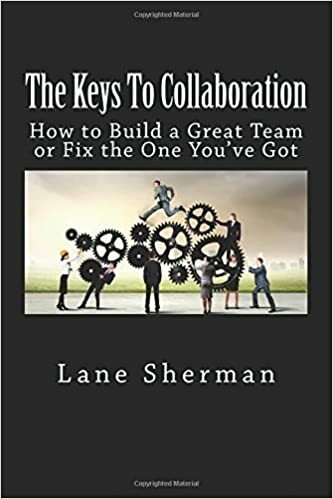 In The Keys To Collaboration: How to Build A Great Team or Fix the One You've Got, Lane Sherman provides practical and actionable guidance for success among teams. Many books on the subject of teamwork rely on broken metaphors or sports analogies. This book is for the busy professional who doesn't want to waste time reading such drivel, but wants some clear, no-nonsense direction. In Part One, Mr. Sherman correctly points out that not all collections of individuals working toward a common goal are actually teams. An often overlooked consideration is the difference between Working Groups and Teams. This distinction is critical for leaders, as all other collaboration efforts hinge upon it. He then goes into the details of his Five Key Factors of Collaboration and explains the tasks that you, as a leader, will need to undertake. In Part Two, the author guides you through the key conversations that will ensure that the team members are equipped for success. These conversations are related back to his Five Key Factors in a manner that is easy to understand and builds upon the foundation that was built in Part One. Part Three covers the day to day management of the team. It is interesting to note that while entire books have been written on this part, it is one of the smallest parts in the book. This is the main differentiator between this book and others that you may have read on the subject of teams. The mechanics of team leadership are actually pretty basic. However without the first two parts, perfect execution of management does not guarantee success... which then makes the fourth part of this book so critical. Part Four is most likely the reason you will purchase this book. Either something went wrong and now you need to fix it; or you want to avoid the dysfunctional teams you've had in the past. Here, the author provides six steps that again, build upon the foundation of his Five Key Factors of Collaboration to guide the team back to the path of success. Even if you are just starting a new team, this is an important section so that warning signs can be identified and corrections made early. Parts Five and Six deal with tools and activities that will be very useful to most teams, but especially remote teams. With almost 20 years of professional experience working with both groups and teams, I can vouch for the value of this book. You will certainly find yourself referring to it again and again, especially if you collaborate with dynamic teams.